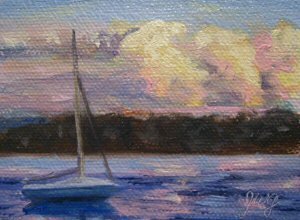 This is a painting of my friend Mary’s boat, out on the lake beside our house at sunset. The clouds were especially spectacular that evening. 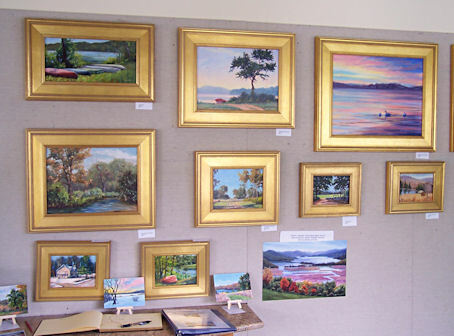 It is painted on unstretched canvas, with artist grade oil paints, and mounted on rag board to give it a permanent, artist grade, archival support. This is a work in progress that was started on location today. 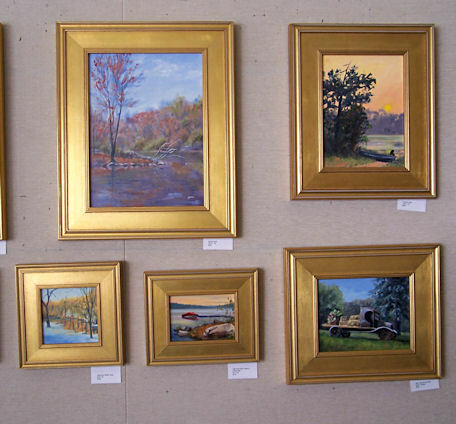 I’d like to get in at least one more plein air day with it, and a third day in the studio should finish it up. You can see how much the light and colors changed once that thick cloud layer rolled in! $500.00 plus $30 shipping and insurance within the Continental United States. For local sales, shipping charge will be allocated to NYS Sales Tax. Please email me at JamieWG@aol.com for International purchases or with any questions. 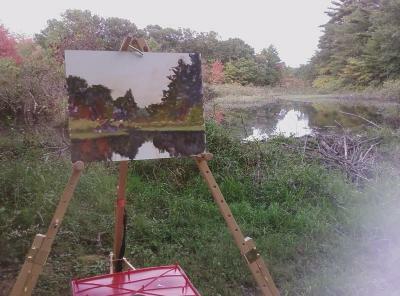 Today I brought my new Beauport easel down to the beaver pond. 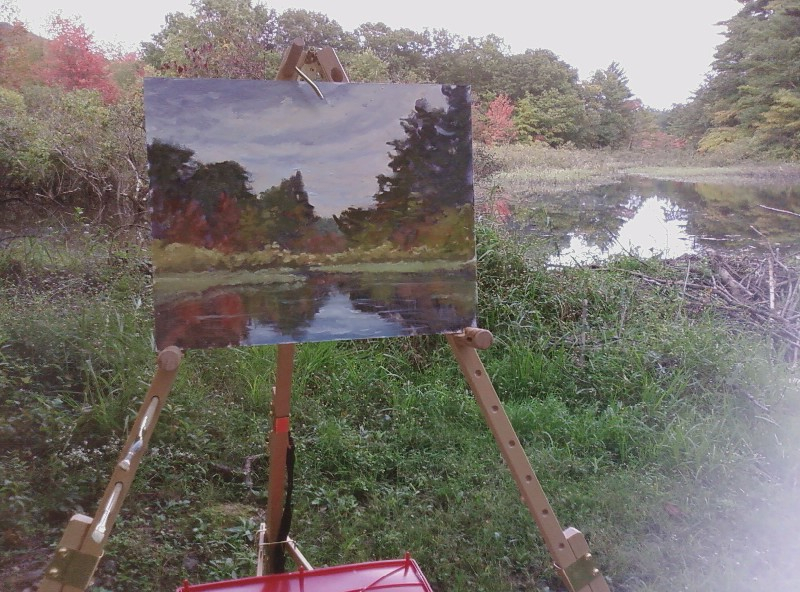 I tried to send progress images to my Facebook page from the painting location, but it doesn’t look like they arrived there. I’ll have to get help from my daughter the expert! I don’t have my imaging software here, so the photo above is shown without any adjusting of the image. Below are images I took with my camera phone and attempted to email to Facebook. It’s not the greatest camera, but at least I remembered to take progress images this time! My viewers are always asking for them, and I never remember to take them. Fortunately, the sprinkles were short-lived. The sky was looking better and better, though it doesn’t show up in the photo. 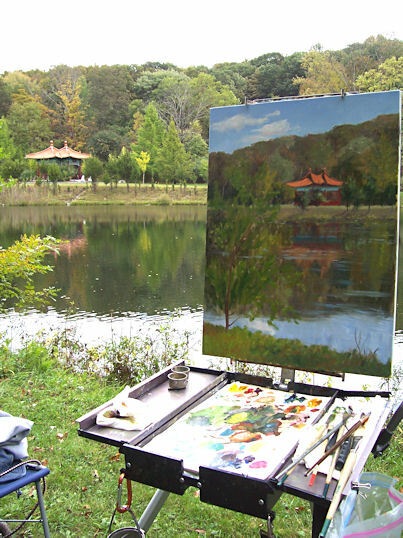 That’s one of the wonderful things about painting plein air. We see so much better than a camera lens. I started blocking in my darks and then local color. I waited to put in the sky because it kept on improving. 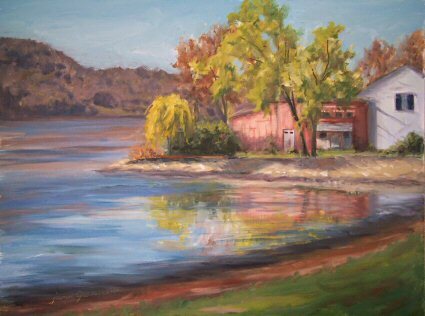 I was glad I waited, because by the time I decided to put it in, it was much better than it was when I started the painting. I was surprised by how much fall color there was out by the pond. The rest of the property is barely showing hints of fall. Here is the painting nearly finished. I am really loving this easel. 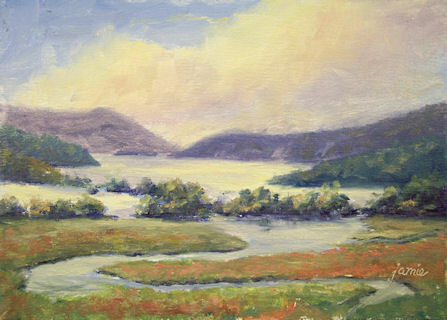 I used a covered Masterson palette with a pad of 12×16″ palette paper in it. That and a 12×16″ panel carrier fit into a Creativo backpack, along with my paints, brushes, camera, paper towels, and brush washer. 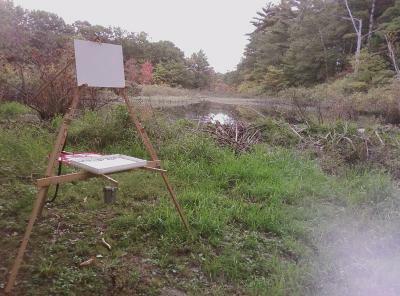 I was surprised by how quickly and easily the easel set up and broke down. The lid of the Masterson palette worked out well to hold my turp container and some paper towels. 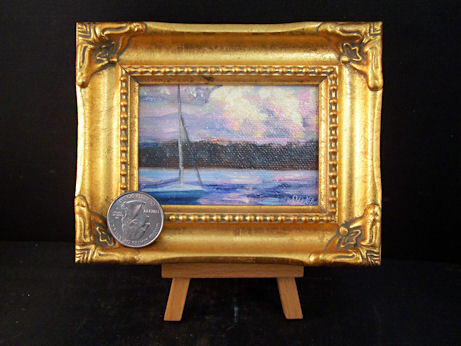 I found the holes in the easel legs to be handy brush holders! This little waterfall presents a nearly perfect composition from any angle. I think I’ve painted it from five different spots now, and I feel I’ve only just begun to explore it’s potential as a painting subject. 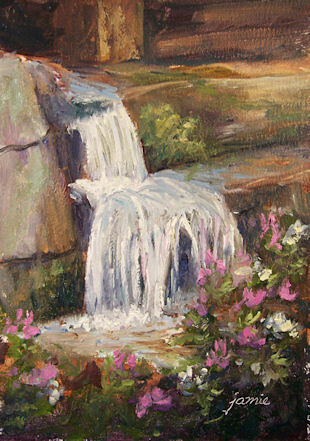 This past weekend, its charm multiplied as the phlox bloomed profusely along the shoreline of the creek. With all the rain we’ve had this season, the mosquitoes have been out in full force. I doused myself with heavy-duty bug repellent and stayed out painting for as long as the mosquitoes would let me! 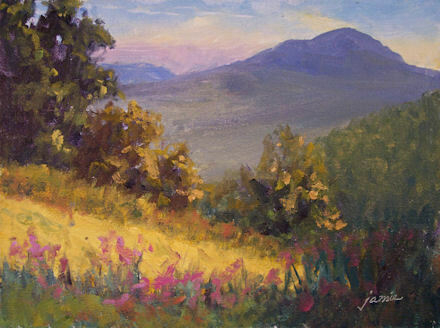 This painting was also done from the top of Hunter Mountain, this time facing eastward toward Kaaterskill Clove, made famous by the Hudson River School painters. 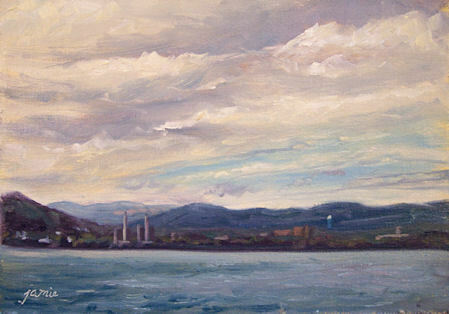 The mountains you see in this painting are the easternmost mountains of the Catskill range. 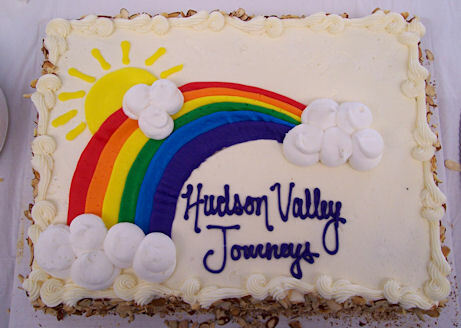 Beyond them stretches the Hudson River Valley. 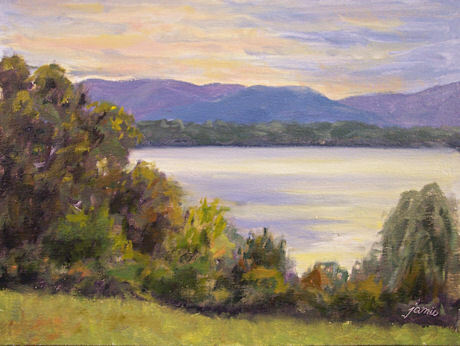 Through that cleft in the mountains on the left lies the former home of Thomas Cole, and across the river is Olana, home of Frederic Church. 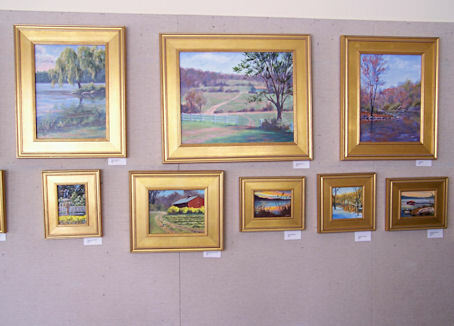 Many of their most well-known paintings were of scenes between here and there. On Friday I took the Hunter Mountain “Skyride” (read “chair lift”!) up to some spectacular vistas from all sides of the mountain. 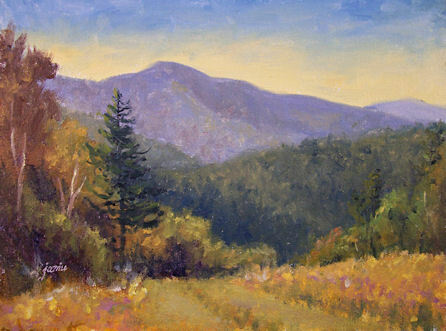 My husband went off to hike to the fire tower while I returned to a favorite spot to paint. The weather was gorgeous, and hints of fall were evident in the foliage. I always forget to stop and take photos while painting outdoors. I get so wrapped up in what I’m doing that I don’t even think about it until I’m already home! I just happened to remember to snap a shot of this painting alongside the scene. What was I thinking? I sat in the blistering hot sun at Tilly Foster Farm for hours to paint this. Even with my large beach umbrella for shade, the heat was too much. 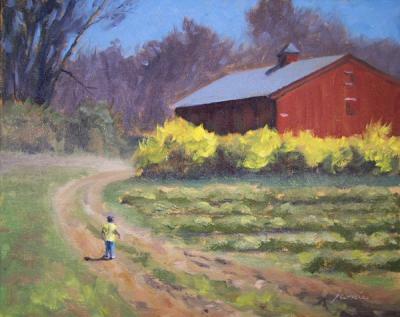 When I was finished, I walked over to where my smart friends were painting, under the shade of a huge tree! It felt 20 degrees cooler there. 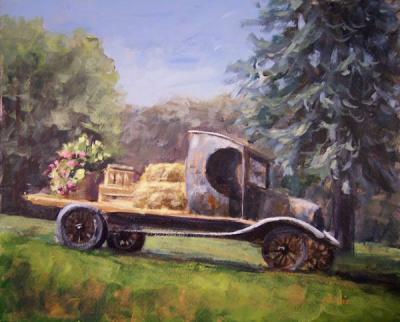 The great subject matter of this old truck was more than I could resist, even in the heat. The hay bales were glistening in the morning sun, and the large barrel of flowers provided the final, beautiful touch.